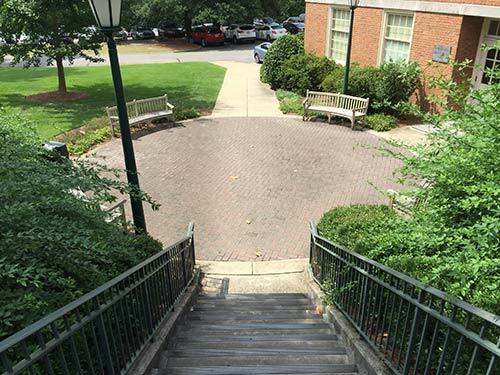 The W. W. Walker Family Plaza can be found tucked away on the side of Samford University’s Russell Hall. The small circular plaza is home to benches and beautiful landscaping. It is a place where students can relax and enjoy some quiet time without the typical campus traffic that the other plazas attract. The plaza was recognized as the Walker Family Plaza in 2003 during renovation of Russell Hall. The former biology building was gutted in 2002 and reconstructed to allow space for new conference rooms, laboratories, offices and classrooms for McWhorter School of Pharmacy and the Department of Mathematics and Computer Science. 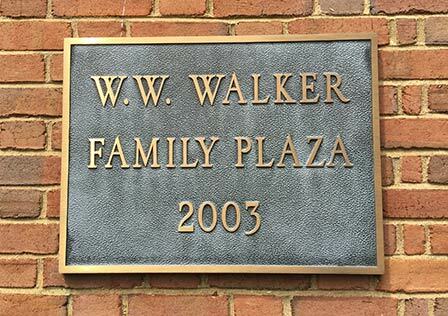 The plaza is named for William W. Walker Jr. and his family business, the Birmingham-based Walker Drug Company. The company, started by Walker’s father, grew to be one of the nation’s premier wholesale drug companies. Walker generously supported both Auburn and Samford pharmacy schools. The plaza was dedicated after Samford received a $100,000 gift from the Walker Family Foundation. Walker and his son, James, were inducted into the Alabama Pharmacy Hall of Fame in 2015. While the Walker Family Plaza is not marked on most campus maps, it remains a discreet spot for students and faculty to take a break and enjoy some peace and quiet. Hidden Gems is part of an occasional series about interesting places, people and things on the Samford University campus.